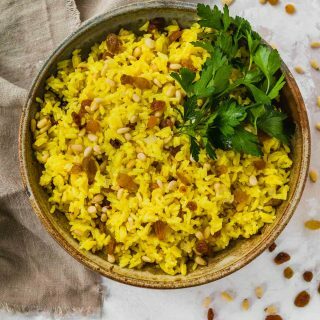 Turmeric rice with golden raisins and pine nuts is a simplified (in effort, not flavor) version of the classic middle eastern side dish that you get with shawarma. It’s a great side dish recipe to keep on hand! This recipe is, as you probably figured out, the second part of the chicken shawarma dish that I posted last week. It was supposed to follow a day or two later but, you know, life happens. Better late turmeric rice than never turmeric rice, amirite? Like most everything I am cooking these days, this recipe is one which yields a lot of food and a lot of flavor from a few ingredients and minimal effort. Pantry ingredients are going to be your go-to here. For example, you can use several different kinds of white rice for the base, depending on what you have in your pantry. After a little grocery-ordering mishap left me with approximately one zillion pounds of jasmine rice, my pantry is well stocked with that variety – so that’s what I used here. A really great alternative to jasmine rice is basmati rice, which can be slightly more expensive, but is well worth it for the excellent texture. 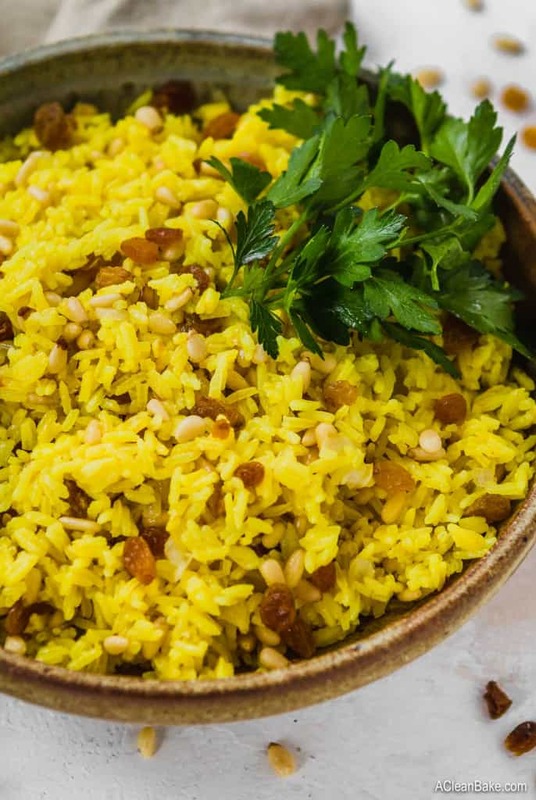 It’s also slightly less prone to sticking together than jasmine, so if you like more distinct grains of rice (which is typical of this rice dish), go with basmati. Either way, rinse your uncooked rice well to remove excess starch, which prevents it from cooking into one large starchy mass. The flavor in this rice recipe comes from several sources: cooking liquid, oil, and add-ins (for lack of a less-clumsy term). You’ll encounter the cooking liquid first, when you’re actually making the rice. The easiest way to hydrate the grains is with water, but for an extra boost of flavor, swap out some or all of the water for chicken broth. In order to keep this dish vegetarian or vegan, you can use vegetable broth instead. The next place to impart flavor is in the oil, which you’ll use to cook the onion, then – briefly – the nuts and raisins, before adding the cooked rice to mix it all together. I highly recommend using olive oil, the flavor of which melds much better with the flavors of this dish. It’s the go-to oil in my kitchen and in mediterranean and middle eastern cooking (the cuisine from which this rice dish derives). I know some of you prefer to use coconut oil in your kitchen, but if you do, try to use refined coconut oil which has a less distinctive coconut flavor. You can also use grass fed butter as the fat. The last flavor element is the add ins: one small onion, a handful of pine nuts and a generous scoop of raisins. Turmeric is a bright yellow root that is dried and ground for flavor and color in cooking. You’ll used the dried, ground turmeric in this recipe – which is easier to find than fresh turmeric, in my experience. Are you already using turmeric in your recipes? It’s been quite the popular food lately, not least of all because its health benefits are manifold. I’ve had it in my pantry for years, but only recently started using it regularly, both for its slightly citrusy and subtly woody flavor and for all the anti inflammatory, immune-supporting, and other beneficial properties. In fact, when my health was at its worst, my doctor had me taking a curcumin supplement to reduce inflation; curcumin is the anti-inflammatory compound in turmeric and the supplement delivered a highly concentrated dose. While that has nothing to do with this aromatic rice recipe, it’s a good reminder of the way some ingredients can pull double duty! You already know how much I rely on my slow cooker to make rice, and you can feel free to follow the slow cooker rice cooking method when making turmeric rice. In this case, make sure you’re adding the ground turmeric with the water and – unlike the regular white rice method – make sure to stir it all together so that the turmeric isn’t all absorbed in one place. The same goes if you’re making the rice in a rice cooker. You can make the rice ahead of time and store it in an airtight container in the fridge until you’re ready to eat it. 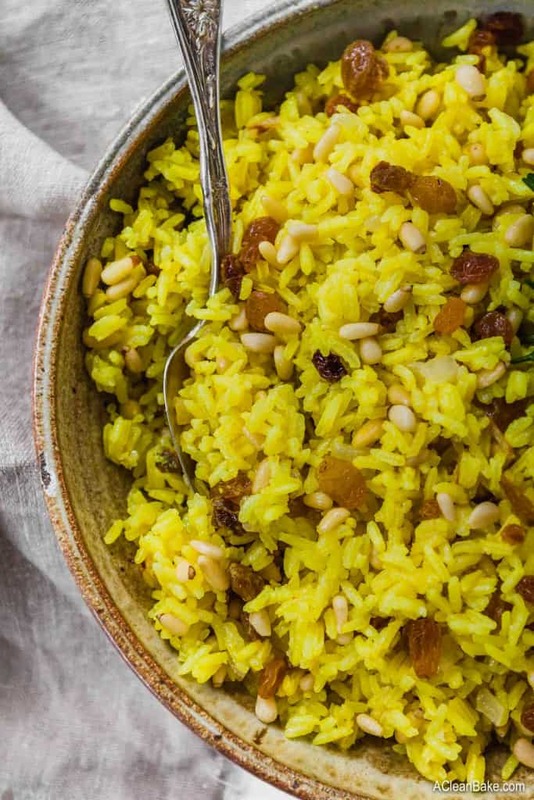 You can choose to add the onion, nuts, and raisins before you store it, or – for an easy way to reheat the rice and make it feel like a freshly made dish – just make the yellow rice ahead of time, and then soften the onion, flavor the raisins and pine nuts, and stir it all together immediately before serving. Well that’s easy: under chicken shawarma, of course! There are lots of ways to use this rice as a side dish, and I find it is an easy way to dress up any chicken dinner. You could also season and grill or pan-fry pork chops to serve with this rice – any vaguely middle eastern flavors will work well as far as seasoning goes – and whatever you do, don’t forget the crunchy salad on the side. 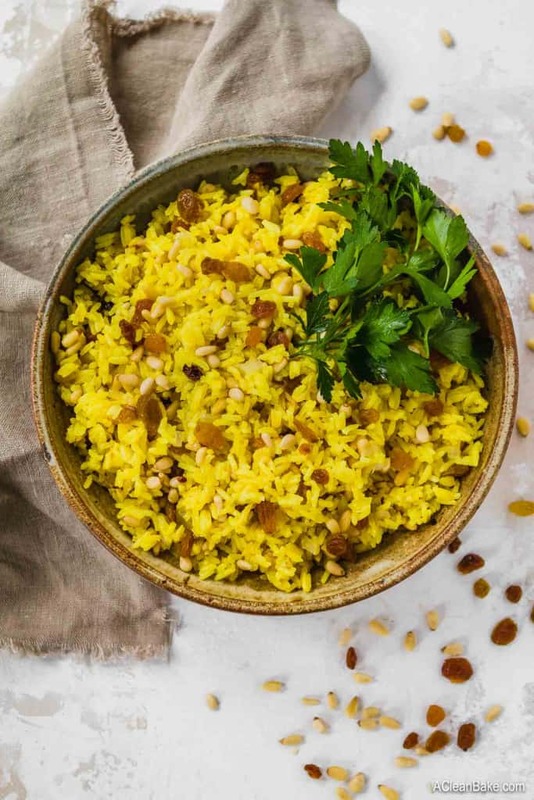 Turmeric rice with golden raisins and pine nuts is a simplified - in effort, not flavor - version of the classic middle eastern side dish that you get with shawarma. It's a great side dish to have in your recipe box! In a fine mesh seive, rinse your rice until the water runs clear. Set rice aside. In a large sauce pan with a lid, bring the water to a boil on the stove top. Add rice, turmeric, and 1/4 teaspoon salt. Stir briefly, and bring back to a boil. Stir again to prevent the rice from sticking from the sides and bottom of the pot, cover, and turn off the flame. Let stand 15-20 minutes, until the rice has absorbed all of the liquid. Uncover and fluff the rice with a fork. Set aside. Heat the oil in a large pan with high sides. Reduce the heat to medium-low and add the nuts, raisins, and remaining salt, and stir. Cook a few minutes, until the raisins have softened slightly. Add the cooked rice and toss everything together. Cook for a few more minutes until everything is heated through and well incorporated. Store leftovers in an airtight container in the refrigerator for up to a week. This was delicious but there is a small mistake in the recipe. The instructions mention onion but there is none in the ingredient list. Goes really well with the shawarma! Really nice substitute for the real thing if you don’t have a giant meat spit. You’re right, Casey! I periodically update recipes to make them simpler and more enjoyable. In this case, I omitted minced onions (and the step that involved sweating them, etc). Thanks for letting me know! I’ve updated the recipe. 2 1/2 cups water was WAY too much. Came out like mush. Hm, that’s strange. I make this all the time and it works fine. What variety of rice did you use? Basmati, Jasmine, or another kind? If you use a different variety of rice, that might make a difference.